SAN DIEGO (NEWS 8) — This Friday, Nov. 9 the News 8 morning crew will take a trip up to Poway and the surrounding areas to showcase those communities of San Diego. 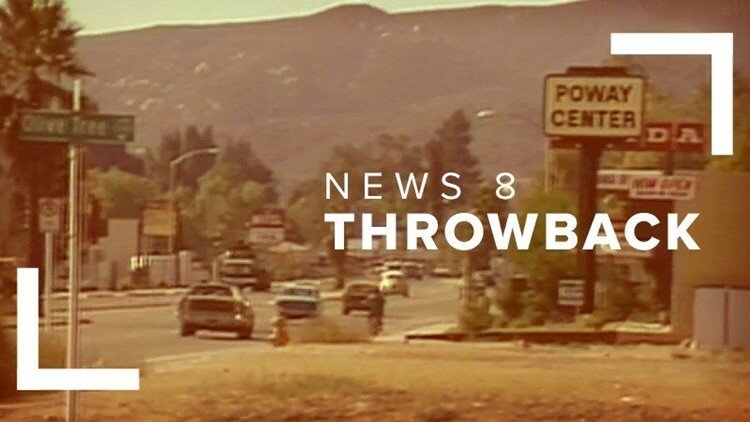 While we wait for TGI8, we dove into the News 8 archives and unearthed some snippets from the past in Poway, Rancho Bernardo and Scripps Ranch. Join us for this walk down memory lane and tune in Friday to see how things have changed! In December 1981, News 8 cameras were rolling as Poway celebrated being a city for one year. City and state officials were on hand for the festivities. News 8's Jesse Macias also reported on the inauguration of Poway's new city hall held the same day complete with the unveiling of a dedication plaque and ribbon-cutting ceremony. In fall 1993, New 8’s legendary reporter Larry Himmel profiled the community of Poway in San Diego. The unique neighborhood combined a growing city with rural pockets. Larry visited Poway's Kountry Kafe for a taste of the "cowboy round-up" - a hearty serving of breakfast - and to chat with the patrons about their community's charm. Part of News 8's "Our Town" series from 1978, this clip showcases the San Diego neighborhood of Rancho Bernardo. Narrator Doug Oliver commented on how the community seemed to spring up overnight. He called RB a place for new beginnings for some and relaxation and retirement for others. In the spring of 2001, News 8's Larry Himmel visited the oldest family owned and operated winery in Southern California - Bernardo Winery in Rancho Bernardo. Master vintner Ross Rizzo gave Larry a tour of the winery grounds which featured shops, a restaurant and - of course - a tasting room. The location is still serving up wine today with Ross Rizzo Jr. at the helm. Part of News 8's "Our Town" series from 1978, this clip showcases the Scripps Ranch area of San Diego. Narrator Doug Oliver talk about new homes being built and the contrast to some areas of the community which had remained unchanged for decades. Oliver also introduced us to a hidden gem in the area - Hendrix Pond. Scripps Ranch High School opened its doors to students for the first time on Sept. 7, 1993 and News 8’s Lorraine Kimel was there to capture the excitement. Dean of Students Barry Owen got fancy for the occasion wearing a dress shirt and bow tie – even while directing traffic. Two years in the making, the school was the first new campus in the district in more than a decade. The school implemented a college-like system where student chose from four career paths or majors.